Walter Frye: Motet "Tout a par moy"
Renaissance composers were famous for basing their mass settings on the merest fragments of someone else's tune. This was not a failure of invention. Instead, it was a way to recognize the contributions of another respected composer. Alternatively, it was a way of catching the listener's interest with snippets of what might have been a "pop" tune of that era. Josquin's Missa Faisant Regretz is based on a secular song by the English composer Walter Frye. This song, Tout a par moy, is thoughtfully included here so listeners can hear where Josquin's inspiration came from. Specifically, a minute or two into the song, the words "faisant regretz" (which here is translated as "ashamed") are sung; Frye sets the words to a falling third, followed by a rising and then a falling tone. (You can get the same effect by plunking out A-F-G-a on a keyboard.) These four notes don't seem like much, but Josquin uses this motif - the falling third in particular – as the basis of his entire mass. Each mass movement opens with this motif, and each movement's progression is based as aspects of the motif. 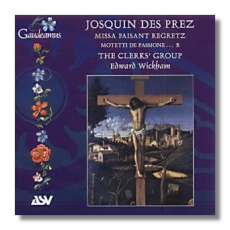 This richly polyphonic work seems to come from Josquin's maturity, and it finds him engaging the listeners' heads and hearts as he engages his own. The five Motetti de Passione… B included here probably are works of a younger Josquin. They tend to be less polyphonic, more "blocky" in style. They are imposing settings of Christian theology, intended to educate as well as to (piously) entertain. These works were collected in 1503 in a publication by a man named Petrucci. When Josquin was believed to have spent his youth in Milan, these works were sagely described as being in Josquin's "Milanese" style. Now that Josquin is thought not to have spent time in Milan (! ), musicologists must look for other explanations as to why these motets are so different, stylistically speaking, from the works of his maturity. Eight members of The Clerks' Group appear here: two sopranos, two altos, two tenors, and two basses. The sopranos are underrepresented on this CD: they appear only in the "Ave verum corpus" setting from the motets. This group, which recently completed an excellent Ockeghem series for AS&V Gaudeamus, now seems to be doing the same for Josquin. They sing with discipline and warmth. Wickham, who is one of the group's basses, obviously has worked hard with the group to promote a good vocal blend and lively scholarship. The recording was made in St. Andrew's Church in West Wratting, wherever that is. With the engineering, there's nothing to complain about. It should be noted that AS&V has reversed tracks 3 and 4: track 3 is "O Domine Jesu Christe" and 4 is "Ave verum corpus."